Canada isn't exactly known for being a national powerhouse in basketball, but over the past few years, so many talented Canadians have made their mark in the NBA. Andrew Wiggins is obviously the most well-known Canadian in the NBA right now, but don't forget about guys like Tristan Thompson, Kelly Olynyk and Jamal Murray. 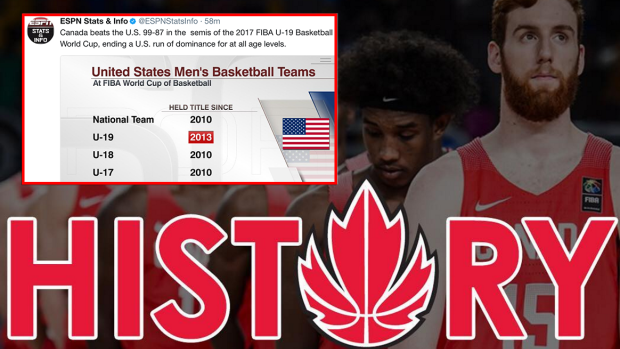 Those names alone prove that when it comes to basketball, Canada is on the rise. If you're still not convinced, though, something incredible happened on Saturday that further exemplifies how bright the future of Canadian basketball is. At the FIBA U19 World Cup, Canada stunned USA in the semifinals and will play for Gold for the first time ever. Nobody could have predicted that result, but it happened and the basketball world reacted accordingly. First time watching @RjBarrett6. Wow. What skill. Huge win for @CanBball over USA. Onto finals of #FIBAU19 for first time ever. Congrats. John Calipari is about to become the first coach of a USA Basketball squad to lose a game since Paul Hewitt (now a NBA scout) in 2011. There's still history to be made, though, and that could happen on Sunday with another win.